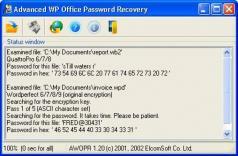 Advanced Office Password Recovery is a password-recovery application for Microsoft Office programs (2003 or older versions). The program can recover lost or forgotten passwords of documents/files created via any Microsoft Office application, such as Excel, Word, Access, Outlook, PowerPoint, OneNote and others. Additionally, Advanced Office Password Recovery is capable of resetting open password-protected VBA projects created with any application, MS Internet Explorer (versions 3, 4 and 5) Content Advisor password. Advanced Office Password Recovery is also very fast: passwords are usually recovered instantly and the “password to open” for Word/ Excel (97, 2000, XP, 2003) documents is retrieved through dictionary and “brute-force” attacks optimized for the highest possible speeds.